Depending upon how quickly you've worked through the previous sections, the stocks in your portfolio might not have seen very big changes in price yet. Usually, investors who are looking to buy and hold stocks do not sell them until, at the very least, a few months after their purchase. However, in this case our goal is to train you how to sell a stock, not to pick the optimal time to do so (learn more about when to sell a stock in The Art of Selling a Stock). Let's walk through a few stock sales so that you can learn exactly what you need to do when it really matters. As you can see in this example Portfolio Summary, some of the stocks purchased have increased in value while others have decreased, which is probably the case with your own portfolio. Take a look through your portfolio and pick a stock. In this example portfolio, we will sell General Electric CO (NYSE: GE) to demonstrate the selling process. First, to sell this stock, we simply need to click on the Sell link next to its listing in our Stock Portfolio. You should proceed to the Trade Stock screen with the correct sale information pre-entered in the required fields. Click Preview Order to proceed to the order confirmation screen (shown below), where you can then click Submit Order to confirm your sale for execution. Be sure to submit your order as a market sell order. Assuming you submit your sell order during normal market hours, it will be executed by our trading system within 20 minutes. If you submitted it outside normal market hours, your order will be executed at the start of the next trading day. Now that you've sold a stock from your portfolio, you should replace it with a new investment. It's probably a good idea to replace the stocks you sold with new ones from the same sector, so that your portfolio will maintain its diversification. In our example portfolio, we sold GE, which is from the Consumer Discretionary sector, so we'll make our new stock pick from those same sector. 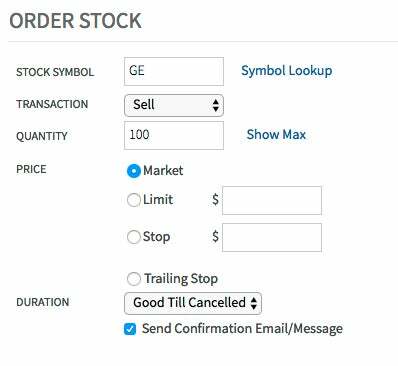 The steps for entering buy orders are very similar to the sell orders we just processed, but if you need a refresher, feel free to review how to buy a stock in stock buying section . If you ever need to review the details of your past trades, you can easily do so by clicking on Trade History, which is accessible as a link after clicking the Portfolio tab. With the completion of this section, you now know how to perform basic market sell orders. This is a step-by-step approach to determining, achieving and maintaining optimal asset allocation. Our complete guide to rebalancing your portfolio will make sure that you maintain your strategy and maximize your returns. Although market crashes are usually bad news for your portfolio, there are ways to handle them. You can defend your retirement savings from the ravages of a bear market. We'll show you how.